REYNOLDS, Ga. – After Thursday’s racing action was washed out by rain at Silver Dollar Raceway, the SFG Promotions World Series of Bracket Racing resumed Thursday’s $15K Warm Up event on Friday along with HiRoller and LoRoller races. The weather delays forced the SFG team to rearrange the racing schedule through the weekend which now includes two $75,000 to win races on Saturday and Sunday instead of the originally scheduled three $50,000 to win events. 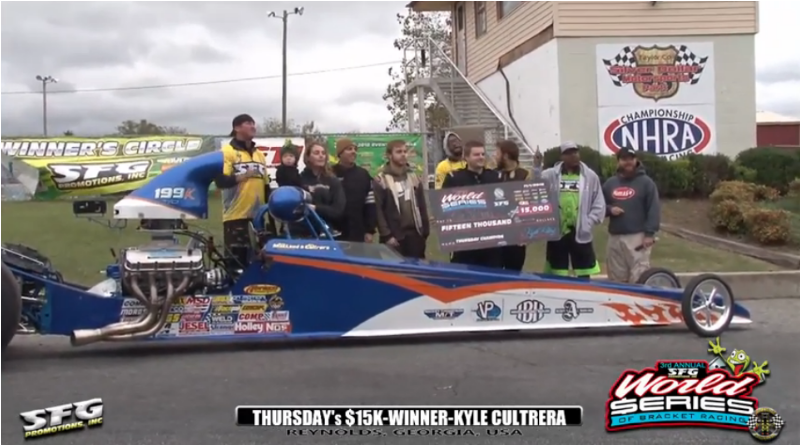 Racers still in competition at the quarterfinal round included Chris Runnels, Jeff Serra, and Eddie Alligood on the doorcar ladder while Kyle Cultreras, Wednesday $15,000 winner Lester Adkins, Troy Williams, and Andre Nunez remained on the dragster ladder. Cultreras used a .001 light and one above 4.639 to dispose of Nunez while Adkins was .014 take .005 to break out by -.001 against the .018-pack of Williams. On the doorcar side Eddie Alligood earned the bye run while Runnels used a .012-pack to defeat Jeff Serra who posted a .000 reaction only to run .022 above his dial. In the semifinal round, Cultreras defeated Williams in a double red-light race, Williams was -.005 and Cultreras was -.003, to move into his second SFG Promotions final in the last month as he claimed runner-up honors at the recently held $100,000 to win Superbowl of Drag Racing event. In the final doorcar pairing of the day, Runnels moved into the final round after Alligood turned it -.022 red in his T-Bird. The final round saw both racers leave with stellar .00 lights as Cultrera let go .004 in his dragster while Runnels was right there with a .005 in his S-10. At the top end Cultrera posted a dead-on 4.604 for an .008-second package to claim the win after Runnels ran 6.105 on his 6.09 dial. With the weather creating a scheduling nightmare for Kyle, AJ, and the SFG Promotions team, they somehow found a way to throw in a couple of bonus events on Friday. The HiRoller and LoRoller results are posted below. In the LoRoller final round former Million Dollar Race winner Nathan Martin drove his dragster to the win when “Nasty” Nick Hastings turned it red in his Pontiac T1000. In the HiRoller final CJ Drake drove his 4.2-second dragster to the win after 2-Time Million Dollar Race winner “Skinny” Kenny Underwood turned it red in his Firebird. After battling rain for the last couple of days, the weekend forecast calls for much better weather which should allow for some great racing in both the Saturday and Sunday $75,000 to win bracket races. Stay tuned to DragChamp.com for the latest drag race results. To watch the 2018 SFG World Series of Bracket Racing line online, click here. For more race results from the World Series of Bracket Racing, click here.